This fin is a glass moulded fin, made under extreme pressure. You can buy this fin in 8 sizes, and all of them are fast. Before I used Select-Fins everybody always told me "moulded fins" comes together with "inconsistency". These rumors came from people with a lot of windsurfing experience. Now I have used several SL7 fins (15 different ones) I can promise that the lay-up is very consistent! The Select SL7 is very powerfull compared to most fins. I came from Drake Slalom Pro, Tectonics Falcon f1, Tectonics Goldwing. But when using a SL7 you can reduce finlenght due the extra power this fin gives, just take for example 1cm off your standard drake slalom pro 34! 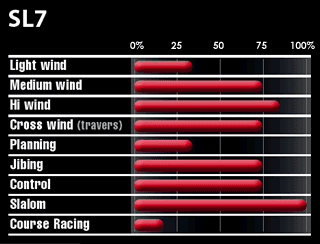 The windrange over 1 size is huge, for example I use the 29cm SL7 from 12kn till high 30kn. Select SL7 is this a speedvin? If you look at the Select Website, you will see that the SL7 is a slalomfin. But in fact one with a very thin profile 9%. Also a blocked twist helps powerup and deepwind speedsailing. The fin has a bit more control than most speedfins, and the profile quite basic. But the magic lay-up and thin profile makes this one of the best speedfins in the world. I heard there comes a new SL-model, can't tell more. But it sounds even faster!!! Can't wait to try the updated SL7. In the Netherlands we all know that Select fins sometimes do have some flaws at the trailing edge. If your fin is whistling, or you think it is not allright you can always send me a picture. 80% of my Select SL7 fins are hand finished by myself.